In 1976 Dean Zelinsky set out to create a guitar that would rival all guitars; he was determined to build a guitar that would sound better and equally important, play better than what he had experienced testing all the brands he could get his hands on in the repair business. In the ’70’s Gibson Guitars had a factory in Kalamazoo Michigan, where they used to provide tours for people. Dean took a tour to learn what machinery needed in order to accomplish setting up a production run of his own designs. After two trips to the Kalamazoo factory, this quick study yielded a plan to seek out similar equipment to start his own company. 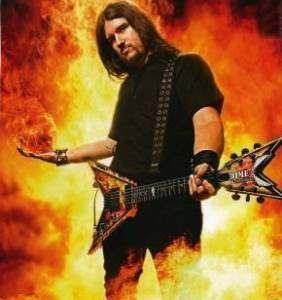 Dean quickly established himself as the ’god father’ rock guitar builder. He brought us legendary rock-n-roll guitars such as the Dean ML, V, Z and Cadillac. Before Dean Zelinsky left Deans Guitar in May 2008, Dean Guitars reissued the 1979 V. These beauties are built to the original specs of the original 1979 Deans which are now collectibles on the open market. The Dean V ‘79 Series V is an incredible replica of the guitars that Dean made back in 1979, complete with the oversized Series 2 -V shaped headstock, bound maple top and zebra humbuckers. With a mahogany body set in mahogany neck, rosewood fingerboard with abalone dot inlays, nickel plated hardware and Grover tuners, the ‘79 Series V doesn’t skimp in any way, shape or form. To keep costs down, these guitars these guitars are manufactured in Korea, but the quality is right up there with what it was when the original models were built in the United States. My review model has a classic black finish with classy single layer white binding. Other finish options include cherry sunburst and Trans Brazilian burst which is similar to a tobacco sunburst finish. The black finish looks classy and aggressive at the same time–like a guitar you could play in wedding band afternoon then take to your death metal gig that evening. Like Dean’s 70’s models, the pickups feature out of phase wiring that that produces a wide variety if single coil and humbucking tones when both pickups are selected just by making adjustments to each pickup’s volume control. The controls consist of a three position pickup selector volume knobs for each humbucker and a master tone control. This is an amazing feature: I actually found myself playing the selector in the middle position more frequently instead of passing right by it, like I would on other guitars. The pickups on the 79’s Series V produce classic humbucker rock and metal tones with an awesome definition and massive balls, and tone wood combo midrange that V players love — this and the guitar’s outstanding playability make it a sololists dream. Now if Dean could only go back in time and bring back the girl in their “Feel the Difference” ad. 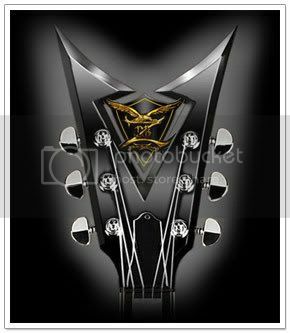 Discuss Dean Guitars at www.Gear-Monkey.com guitar forum. Visit DBZguitars.com to see Dean’s new axes. 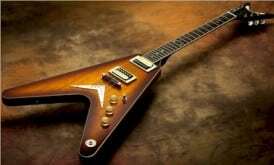 Hey Gary, I saw pictures of your Dean V on eBay (the one you bought) and it looks like a reissue. It has the newer technology rubber ink stamping on the back of the headstock for the serial number instead of hand stamped wood indentation found on older models.